lies in a water hazard (Rule 24-2). Golfers are sometimes confused as to whether they may take relief without penalty, or not. Here is my non-exhaustive list as to when you may take relief, when you are not entitled to take relief and when you may only take relief if there is a Local Rule that permits. o a hole, cast or runway on the course made by a burrowing animal, reptile or bird. • When your ball is embedded in a closely mown area (Rule 25-2). • From tee-markers after making your first stroke with a ball on a teeing ground (Definition of Tee Markers). • From a hole made by a green keeper, which qualifies as ground under repair (Decision 25/14). • From any material piled for removal by the course staff (Definition of Ground Under Repair). • From a situation that could be dangerous to the player, such as near a live rattlesnake or a bees' nest (Decision 1-4/10). • From immovable obstructions when your ball lies in a water hazard or lateral water hazard (Rule 24-2). • From objects defining out of bounds, such as walls, fences, stakes and railings (Definition of Out of Bounds). • From soft, mushy earth, which is not casual water, unless water is visible on the surface before or after the player takes his stance (Decision 25/1). • Cracks in the earth and tyre ruts, which are not ground under repair unless declared as such by the Committee (Decision 25/12). • From footprints made by a burrowing animal, reptile or bird (Decision 25/19.5). • From an unpleasant lie, such as when the ball is at rest in poison ivy, cacti or stinging nettles (Decision 1-4/11). • From grass cuttings and other material left on the course that have been abandoned and are not intended to be removed (Definition of Ground Under Repair). • From staked trees (note that even if there is no Local Rule relating to staked trees golfers may take relief from the stake itself, which is an immovable obstruction). • From immovable obstructions that are close to the putting green, e.g. sprinkler heads. • When a ball is embedded in its own pitch-mark anywhere through the green. Did you know that you can now purchase my eBook, ‘999 Updated Questions on the Rules of Golf 2012 –2015’, for less than you can buy it on Amazon? Also, I will send you both .pdf file and Mobipocket file enabling you to read it from your computer, smart phone (iPhone or Android), Blackberry, iPad, Kindle, etc. Click here for a free sample and more information. This one was a bit confusing, May Not Take Relief Without Penalty: From tee-markers before making your first stroke with any ball on a teeing ground (Rule 11-2).. I had to go to the rules to determine what was meant. The implication was that the golfer couldn't move their ball to get relief. However, in this case it meant that they couldn't move the "offending" tee-marker. It is quite legal to move/re-tee their ball. Barry, should one have the misfortune of both being in a bunker and needing or wanting to seek relief from an immovable obstruction in that bunker , there are 2 scenarios that you did not mention in your blog. Thanks, you are quite correct. I am sure that there may also be other unusual situations that I did not cover, which is why I clarified that my list was 'non-exhaustive'. Can you tell me when the decision cited below has changed and how do we deal with the situation described in that version of the decision. Q. A right-handed player’s ball is in a poor lie. A nearby immovable obstruction would not interfere with a normal right-handed swing but it would interfere with a left-handed swing. The player says he wishes to play his next stroke left-handed and, since the obstruction would interfere with such a stroke, he is entitled to proceed under Rule 24-2b. May the player invoke Rule 24-2b? A. No. If the only reason for the player to use a left-handed stroke is to escape a poor lie, use of an abnormal (left-handed) stroke is not justifiable and the player is not entitled to invoke Rule 24-2b — see Exception under Rule 24-2b. Are you sure that you are referring to Decision 24-2b/19? The only change that I can see in this Decision over the past 10 years is that the word 'unreasonable' has been replaced with the word 'impracticable'. Is it legitimate to take relief from an area that is not marked by any boundary stakes (in bounds lets say) but the ball comes to rest on a well traveled dirt area that its obvious is used by mowers and maint equip to take shorter route than the cart path? By the way the cart path at that point goes east and west, and the supposed dirt road area goes north and south with plant & shrubs on either side. If the area is in bounds and is not designated as Ground Under Repair by a sign, white line or Local Rule, there is no relief. The player must play their ball as it lies or deem it unplayable and take one of the options under Rule 28 for a penalty of one stroke. See my blog entry dated 11th March 2011 titled, 'Tyre Tracks and Other Course Equipment Damage'. Is it okay for a committee to make a local rule deeming Hazard stakes as immovable obstructions. To prevent golfers pulling out markers and not replace them correctly, ( or not replace them at all ). Yes, stakes used to define the margin of, or identify a water hazard are obstructions. If they are easily movable they may be removed in order to make your stroke, but don't forget to replace them! A ball touching a water hazard stake is in the hazard. A player may remove the stake (a movable obstruction) from the hazard. If their ball moves while they are removing the stake they must replace it where it was before they moved the obstruction. The ball remains in the hazard. No penalty is incurred in these circumstances. one thing that has always confused me when taking relief is where do you mark your one or two club lengths from? - from the point that they ground their club after taking their stance. I recommend that you read my blog on this subject, 'Drop Within One or Two Club-lengths?' dated 9th February, 2010. You will also benefit from viewing my short video on 'Nearest Point of Relief' at http://www.RhodesRulesSchool.com/videos. However, in most cases, when you take free relief under the Rules, e.g. from an immovable obstruction, casual water, GUR, wrong putting green, or a staked tee (when there is a Local Rule), you must drop within one club-length of the nearest point of relief, not nearer the hole. Whereas, when you are taking a penalty drop, e.g. from a lie you deem unplayable, or a lateral water hazard, then you are permitted to drop anywhere within two club-lengths of where the ball was at rest, for an unplayable lie, or from where the ball last crossed the margin of a lateral water hazard, not nearer the hole." I have always thought that "runway" included footprints of animals. After reading your blog I now know it doesn't. What are examples of "runway" from which relief is allowed? In the context of an abnormal ground condition a 'runway' is an irregularity of surface created by the repeated toing and froing of a burrowing animal, a reptile or a bird (e.g. the entrance to an underground rabbit warren). One of our opponents lands on an area where grass cuttings are piled and then removed, amongst some trees, ie there is evidence of flattened grass cuttings. He asks for relief and my partner gives him a drop. He takes the drop on the same area without taking complete relief. My partner goes to him and informs him that he must take complete relief from the area he is asking for a drop from. He then re drops. is there a penalty for this incorrect drop ? The format was a 4 ball better ball stableford match. First, in my opinion relief was not available from the area that you describe. There is relief from loose impediments piled for removal, but once they have been removed there is no relief from the area where they previously lay. Any stray loose impediments left behind may be removed without penalty, providing the ball is not moved while doing so. Assuming the player was entitled to relief, there is no penalty for dropping their ball in a place that did not take complete relief from the interference, providing the ball was not played. The player must drop their ball again in the permitted area, taking full relief. Barry thanks for clarifying that for me. Another question for you. My partner tees off and his ball goes straight for a concrete tree lined drainage channel (lateral water hazard) on the left of the fairway. The 4 ball is sharing a spotter who indicates with hand signs that the ball has gone into the channel. We arrive at the spot where his ball crossed into the hazard and the spotter informs us that he didn't see the ball come out of the channel so assumes it has been washed away by the stream. We look for another minute or 2 and find nothing. My partner then drops another ball at point of entry and hits it onto the green. We proceed to my ball, I play my shot and then we walk towards the green. On the way to the green and about 50 meters forward we notice a ball lying in the semi rough which we identify as my partners ball due to the markings etc. My partner then asks one our opponents if he can play his original ball which he has now found and which was not in fact lost in the hazard, without incurring a penalty. He agrees that he can without penalty and he knocks it stiff onto the green, picks up the second ball he played, and proceeds to sink his birdie put. Is this correct or should the second ball he played be the one which is in play and be one that he should have holed out with, with a penalty drop ? 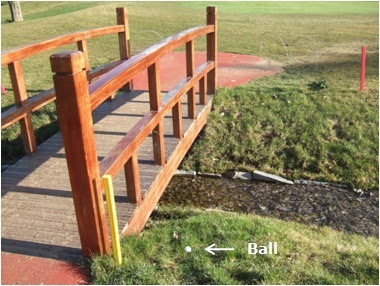 The player was entitled to take relief under penalty of one stroke from the water hazard, because there was strong evidence that the ball was lost in the water hazard. However, as soon as he made a stroke at that ball it was his ball in play. By playing his original ball when it was found he played a wrong ball incurring a penalty of two strokes in stroke play or loss of hole in match play. In stroke play he would have been disqualified from the hole, if he played from the next teeing ground without holing out with the ball in play, and as his partner your score would have counted. In match play (you used the word opponents, which indicates that it was match play), the opponents could not make a claim after players had teed off from the next teeing ground and so the result of the hole stands, even if it was won or halved by the player who holed out with the wrong ball. Please do not use the comments section of my blog for questions that are 'off topic'. You can email me at rules at barry rhodes dot com. What is the ruling for having your ball laying in gravel that is not a path? Where I play it is a newley constructed course and on the cart path side opposite the fairway in between parallel holes there is gravel and what looks to be grass starts that have been planted in rows but in between the grass starts there is roughly 8" columns or gravel. My question, is there free relief from the gravel as if you struck the ball 1- you would damage your equipment and 2- you could cause some damage having 1 inch pieces of rock shooting into the air. If not free relief then what are the options? In some cases a club length from the unplayable spot still has you in the rocks. In answering your question I am assuming that there is no Local Rule clarifying the status of these gravel strips. From your description the gravel cannot be considered an immovable obstruction, as is the case with artificially-surfaced paths. Therefore, no relief is available under Rule 24-2. However, gravel is a loose impediment, which may be removed from around the players ball, taking care not to move the ball while doing so, as this would incur a penalty of one stroke under Rule 18-2a, and the ball must be replaced (Rule 23-1). In my opinion, the Committee should introduce a temporary Local Rule permitting relief from these gravel areas. On my course we have areas where birds like to take dust baths. This creates surprisingly deep holes at times. Is free relief available from these depressions if your ball comes to rest in them as they are not for "habitation or shelter" This issue has caused a lot of debate at our club. The Rules of Golf do not permit relief being taken from these depressions that you describe. They do not meet the Definition of Abnormal Ground Condition. However, your Committee may consider establishing a Local Rule permitting relief. Thanks for your reply. I've always believed what you have said to be the case, but have been 'overruled' on a number of occasions when others have taken free drops. I have never claimed a freebie for it and wanted to find out if I have been unfair to myself. Hi Barry: at our club we have a Local Rule permitting relief from kangaroo paw marks in bunkers. We now have a problem with the geo-matting that lies under the sand in the bunkers being lifted, mainly as a result of the grooming machine. These lumps of matting are dangerous and have already caused one serious injury. Can a committee introduce a Local Rule providing relief if a player's ball lies on this matting? No Local Rule is required for the circumstance that you describe. The lumps of matting are immovable obstructions and Rule 24-2b(ii) already provides relief for immovable obstructions in a bunker that interfere with a player's lie, stance or area of intended swing. If the player's ball was at rest in a position where they could not make a reasonable stroke at it then they were not entitled to take relief from the path, see the Exception to Rule 24-2. I have tried to explain this subject in my blog titled, 'The Rules of Golf Are Not Always Black and White', dated 29th October 2014. It had been raining a lot and my ball though found was in surface water.I was told I could place my ball on the fairway nearest yo where my ball entered rough.I believe I should have gone back as far as poss keeping in the rough unroll I had a fetish standing.Seems moving onto fairway improves my stance and lie? If there was surface water around your ball you were entitled to take relief without penalty under Rule 25-1, Abnormal Ground Condition. The procedure is to determine the nearest point of relief where there is no interference from the casual water and drop within one club-length of that point, not nearer the hole. If the fairway was within this permitted area of drop then you could drop the ball there. You were not permitted to place the ball unless there was a temporary Local Rule in place for 'winter rules' in which case you could then lift the ball from where it came to rest after the drop and place it within the permitted distance. The ruling from the Pro was correct, because you could not be certain that the ball remained in bounds and in the 'immovable obstruction', so the relief available in Rule 24-3b(i) is not applicable to the circumstances of your question. As the ball is therefore lost the player should have returned to where they last played from under penalty of stroke and distance. Barry, a ball hit in a lateral hazard comes to rest in a pile of brush that has been cut and stacked for removal. Do you get relief from this "MOVEABLE OBSTRUCTION"? A pile of brush piled for removal is not a movable obstruction as the brush is natural and therefore loose impediments. The pile does qualify as ground under repair (see the Definition), but there is no relief from any abnormal ground condition in a (lateral) water hazard, Rule 25-1b. At my club, the long rough is cut down during the late summer each year and left to dry for several days before being bailed for removal by the farmer. I would be grateful if you could provide an opinion on the status of such grass which lies about the course prior to it being bailed. My contention is that, as the grass is not "piled for removal" even though it is intended to be removed after it has dried and been bailed, it is in the interim defined as a loose impediment. I agree with you. The grass is not piled for removal so any cuttings are loose impediments, which may be removed from around the ball without penalty, providing the ball is not moved while doing so. Is complete relief required when taking relief from a water hazard? Eg, if there only is a small area to drop not nearer to the hole, I would drop (twice), place the ball and play while standing in the (dry) hazard. Short answer, "No". Check out my blog titled, 'When Complete Relief Need Not Be Taken', dated 4th December 2013. Barry have a question for you. So their is fairway stakes say the 150yd stake and it interferes with the footing when removed from the ground and say that person was in the rough can it be moved to the fairway for a free drop? If the hole left by the stake is an 'artificial' (manufactured) base, as is usual, then the player may take relief from it, as an immovable obstruction if it interferes with their stance. This may include dropping a ball on the fairway, providing the fairway is within one club-length of the nearest point of relief not nearer the hole. If the stake is just pushed into the ground, with no artificial base there is no relief from the 'natural' hole. I have a small query , tree pit as per local rules is a free drop. also local rule of tree if coming in swing is free drop. Now if the ball is to the right side of tree pit making it difficult to stand and play due to tree pit. And two club lengths are in tree pit. Is the player not supposed to move behind where he can play in line of flag and where the ball lies. The query is if two club lengths fall in pit he losses a stroke or not incase he wants to play from outside the pit as it improves the lie and line both . Or will he be given a free drop. I do not see the problem here. When taking the relief afforded by the Local Rules from either the tree or the tree pit the player has to determine the nearest point of relief where there is no interference to the lie, stance or area of intended swing. Then the player must drop a ball within two club-lengths of that point, not nearer the hole. If the ball rolls to a position where the tree (pit) still interferes they must drop again and if it happens for a second time, place a ball where the ball hit the ground on the second drop. Your question, "Is the player not supposed to move behind where he can play in line of flag and where the ball lies" does not make sense to me, so the answer must be, "No"! Perhaps you are getting confused with one of the options for taking relief from a water hazard Rrule 26) or unplayable lie (Rule 28), which is not relevant to the circumstance that you describe.